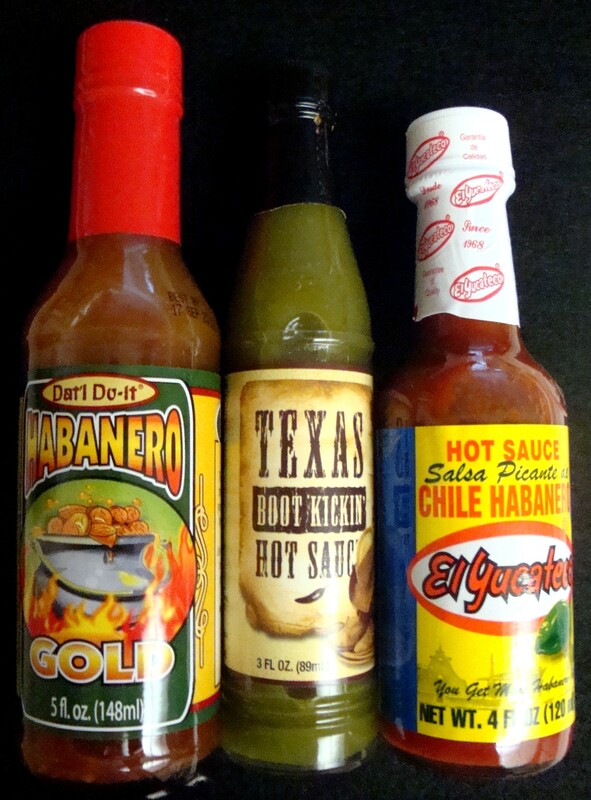 Music – “Who Stole The Hot Sauce?” from Who Stole The Hot Sauce? by Chubby Carrier. Released: 1996. 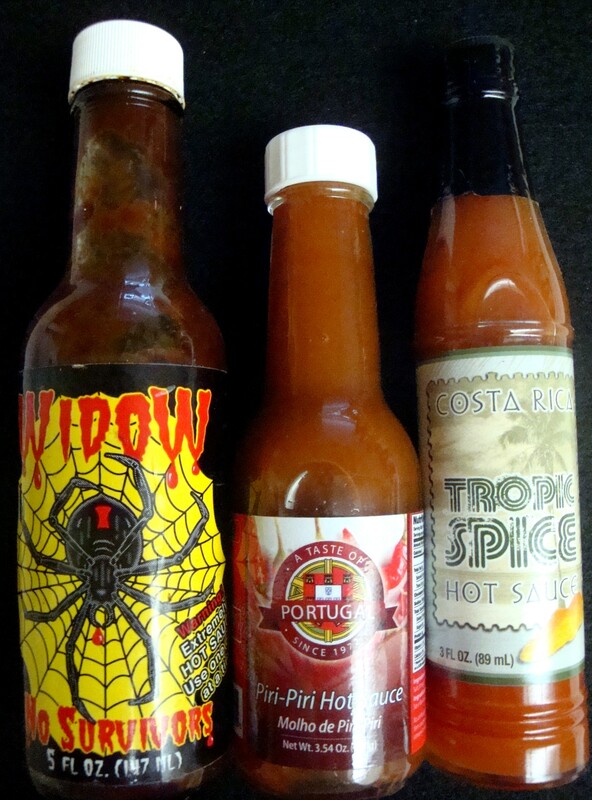 What is it about hot sauces that many of us crave? What twisted, sadistic, self-immolation tendencies do some of us have that drives us to experience the pain of imbibing hot sauce and come back to do it again and again? Hot sauces, although currently very trendy, are nothing new, and cultures around the world have been growing peppers (capsicums), for thousands of years and creating sauces with them. Scientists have known for many years that the primary ingredient in most hot sauces is capsaicin from capsicums (peppers). In addition to a food product, it’s used in creams and ointments to alleviate pain in muscles and joints and as an aid in digestion, among other remedies. The heat in hot peppers causes your brain to produce endorphins, which produce a mild sensation of a high or a kick. In addition, a lot of people, myself included, just like the flavour of hot sauces and there are hundreds of different ones out there, which vary in the types of peppers (capsicums) as a base, the addition of various vinegars, herbs and spices, and more. Capsicums have a lot of Vitamin C, as well as other nutrients. The British Journal of Nutrition published a study (date unknown), which suggested that adding capsaicin to foods caused people to eat less during meals and for some time afterwards. It may act as an appetite suppressant or increase the number of calories burned. Now you can get your hot sauce fix and lose weight at the same time, but who wants to put a few drops of “Last Rites Hot Sauce” on your morning oatmeal? A pharmacist, Wilbur Scoville invented the Scoville Organoleptic Scale in 1912 to measure the heat of peppers. A “Scoville Unit” is a measure of the capsaicin in hot peppers (the chemical that is responsible for their heat). Scoville’s test was a comparative taste test, considered subjective by today’s standards. A more sophisticated method is in use today, but in honor of Wilbur Scoville, the unit of measure is still called the Scoville scale. The capsaicin level in peppers can vary from plant to plant due to local environmental conditions. As a result, the Scoville Units for a pepper are usually an average measure of the heat. 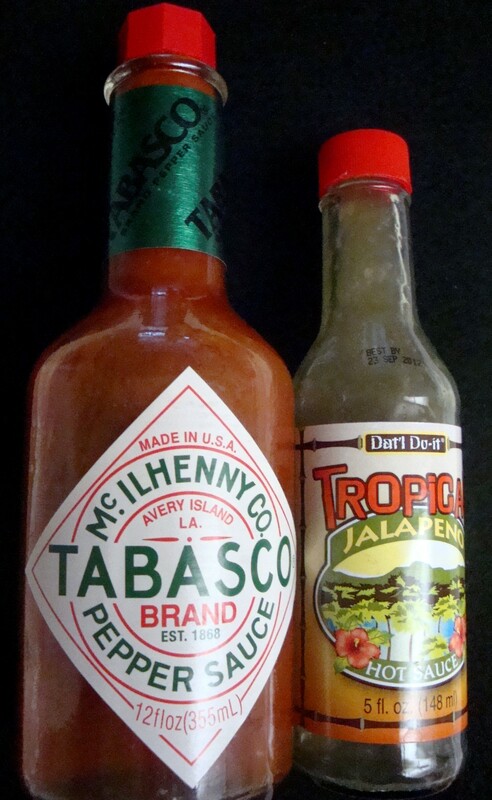 Tabasco, the ‘gold standard’ and another hot sauce…. 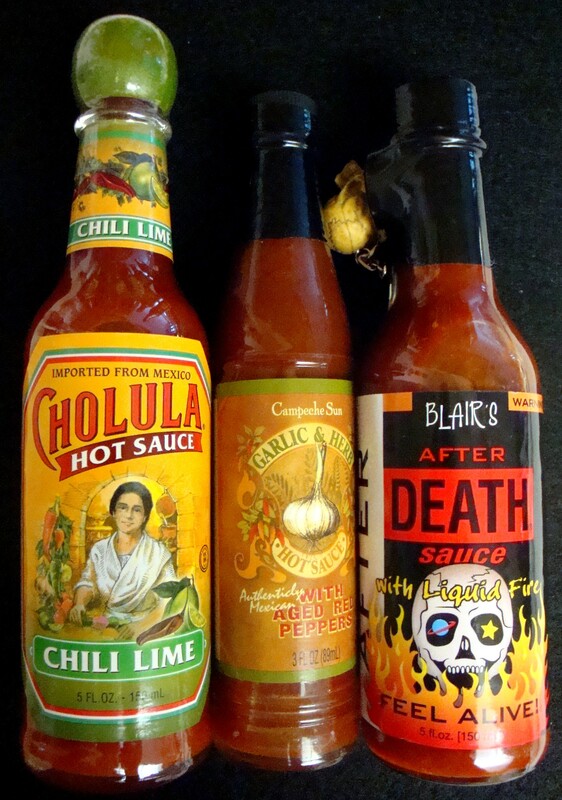 A list of some hot sauces rated from suicidal to barely there on the Scoville scale list “Blair’s 16 Million Reserve” (from Gardner Resources, Inc.) at the top of the current scale, with a whopping 16,000,000 Scoville Units. Yep, that’s right, sixteen million! That’s a lot of heat! According to a description of the sauce, it was sold in 1ml vials (that’s pretty small), and contained pure capsicum crystals. The advertisement for the sauce adds that only 999 ‘Blair’s 16 Million Reserve” would be produced, and the day I checked the ad, the notice at the bottom said “Sorry…out of stock”. 999 hot sauce lovers got there ahead of me. Darn. Blair’s has numerous other hot sauces, ranging from 16,000,000 to a wimpy 49,250 Scoville Units (Blair’s After Death Sauce). It should be noted that common pepper spray (used on the bad guys), averages about 2,000,000 units. Serves them right. In terms of the actual peppers, the lowest on the Scoville chart is Pimento, with 100 to 500 Scoville Units. Don’t even bother to call a bell pepper a “pepper”, even though it technically is….it isn’t even worth mentioning, at 0 Scoville units. Currently, the world’s hottest pepper is the Bhut Jolokia, from India, which weighs in at approximately 1,001,304 Scoville Units. Just about anything goes, if you want to make your own hot sauce. I usually grow about half a dozen kinds of peppers in my garden in Albuquerque, and this year’s crop included Habanero, Scotch Bonnet, Sandia Green Chile, Thai Peppers and a couple of others, whose names have escaped me. My recipe for hot sauce is pretty simple: USING GLOVES!, I remove the stems and cut the peppers in half longitudinally, without removing the seeds (that’s where most of the heat is). Into a big pot with about a ½ cup of cider vinegar, cover and let simmer on very low heat until the moisture begins to break down the peppers. Stir occasionally. When reduced to a thick sauce, whirl with an immersion blender or similar appliance, and add freshly ground pepper and salt (also freshly ground from coarse), to taste and more vinegar, if you like. That’s it. 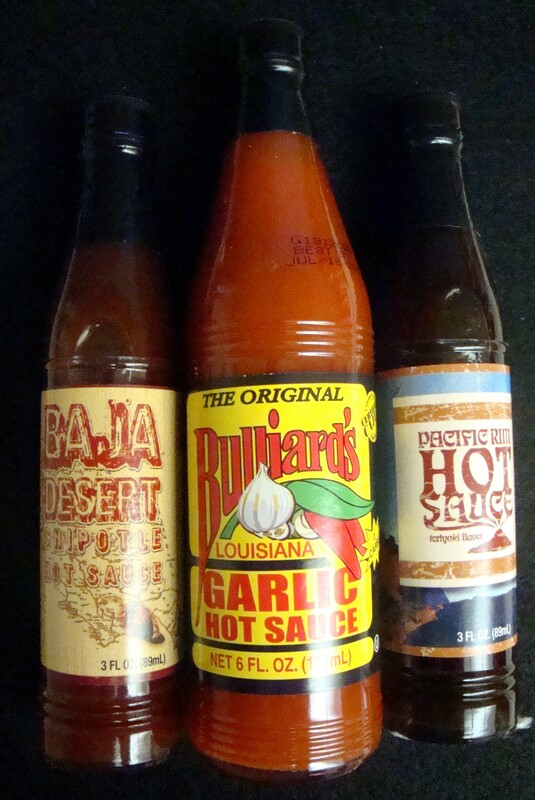 When cooled, I bottle mine in old hot sauce bottles and refrigerate or freeze in containers. Because of the acidity, the bottles keep in the refrigerator for some time, even if you only use a tiny bit at a time (I cook with a LOT of hot sauce). I just call mine “Killer Hot Sauce” and, as in the old Brylcreem hair pomade ads of the 1960’s, “A little dab will do ya”. Now go out there and buy a bottle of “Widow Maker” and start having fun! This entry was posted in Cookbooks, Cooking, Cooking and Social History, Eating, Food Trends, Recipes and tagged capsaicin, Capsicum, cookbooks, Cooking, Endorphins, food history, Green Chile, Hot Sauce, Peppers, social history, Tabasco, time capsules. Bookmark the permalink. 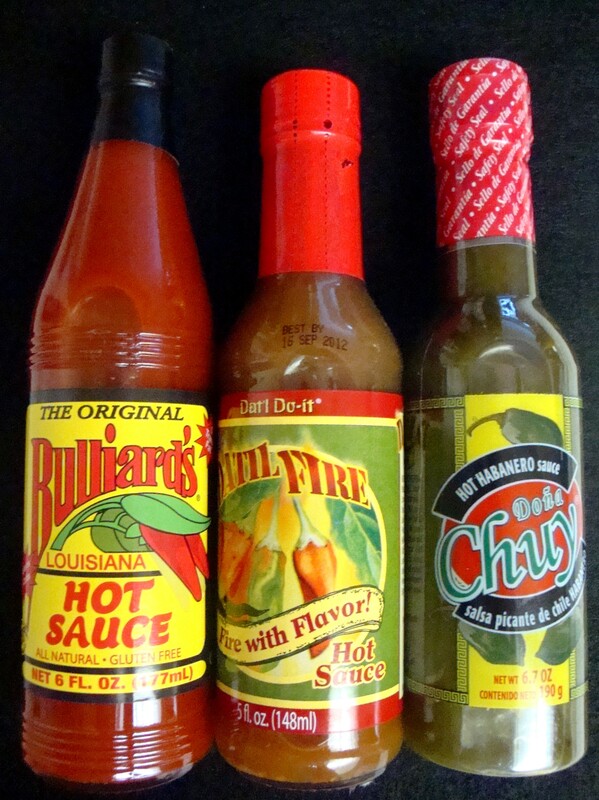 1 Response to From Acid Rain to Zulu Fire….we LOVE Hot Sauces!